For other uses, see Cream soda (disambiguation). Cream soda is a sweet carbonated soft drink. Traditionally flavored with vanilla, a wide range of variations can also be found worldwide. A recipe for cream soda—written by E.M. Sheldon and published in Michigan Farmer in 1852 at a farm in Linstead, Jamaica—called for water, cream of tartar, Epsom salts, sugar, tartaric acid, egg, and milk, to be mixed, then heated, and when cool mixed with water and a quarter teaspoonful of soda (sodium bicarbonate) to make an effervescent drink. Alexander C. Howell, of Vienna, New Jersey, was granted a patent for "cream soda-water" on June 27, 1865. Howell's cream soda-water was made with sodium bicarbonate, water, sugar, egg whites, wheat flour, and "any of the usual flavoring materials—such as oil of lemon, extracts of vanilla, pine-apple, to suit the taste" before drinking, the cream soda water was mixed with water and an acid such as tartaric acid or citric acid. In Canada, James William Black of Berwick, Nova Scotia was granted a U.S. patent on December 8, 1885, and a Canadian patent on July 5, 1886, for "ice-cream soda". Black's ice-cream soda, which contained whipped egg whites, sugar, lime juice, lemons, citric acid, flavoring, and bicarbonate of soda, was a concentrated syrup that could be reconstituted into an effervescent beverage by adding ordinary ice water. In the United States, cream soda is often vanilla-flavored and is either clear or colored a light golden brown in appearance; but red, pink, orange and blue are also relatively common color variants. 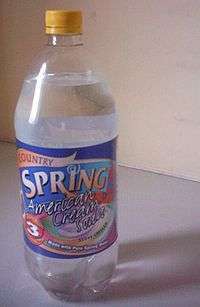 In addition, in some places in the U.S. where the drink is made on location, especially in cafes, cream soda consists of soda water, vanilla syrup, and cream or half and half. In Canada, cream soda is mostly red (except in Quebec and Nova Scotia where it is sold clear) and tastes like grenadine. Some brands, such as Fanta, market a colorless version. Many brands have a long-lasting, foamy head. Grace Cream Soda – "Genuine Caribbean taste"
Some American brands are available in Canada as imports. Cream soda is usually served as a "red pop", particularly Fanta's Red Cream Soda. In Australia, cream soda, creamy soda, or creaming soda generally refers to a pink or red soft drink with fruit and berry flavors produced by Kirks, Bundaberg, and Bickford's, among other brands. Another local variant produced by Golden Circle is vanilla and fruit flavored, and colored yellow to distinguish from existing brands. More traditional brown varieties are also available, however less common. Brands include Kirks' Sno Cap (only available in South Australia and the Northern Territory), Tarax, River Port, and Schweppes, who also produce a red variety as part of its "Traditionals" range. This is known as Creaming soda, Ice cream soda, Chill drink or cream soda, though the flavor changes are negligible. It is usually a bright yellow color or a white opaque. It is one of the many flavors sold by Foxton Fizz. It is also one of the many carbonated drink-flavors offered by Golden Circle. Another variety is one referred to as Italian cream soda. This is usually a mixture of carbonated water and half and half or cream combined with vanilla syrup. Ratios vary widely, but the taste is usually that of sweetened, flavored milk. The Netherlands has only one brand called Frizz, which is caramel-colored. However, Asian (especially Chinese) supermarkets also sell Schweppes Cream Soda. The cream sodas are imported from Hong Kong. In the UK, cream soda was traditionally served with a dessert-spoonful of vanilla ice cream floating on the top, but this became a rarity in recent years. It is vanilla-flavored, slightly glutinous and has a uniquely thick, "soft" and long-lasting foam. A.G. Barr, Ben Shaw's (a Cott brand), and DG Jamaica manufacture their own brands of cream soda, and most supermarkets sell it under their respective own brands. Pakola, a Pakistani brand of ice cream soda, is available in most Asian retailers. In Hong Kong, the Swire Coca Cola Company markets a yellow Schweppes Cream Soda. Some people enjoy Cream Soda in a 1:1 ratio with fresh milk. In India, two brands of cream soda are Cottons and Bijoli. In Japan, "cream soda" is a term used for an ice cream float made with melon-flavored soda topped with a scoop of vanilla ice cream. In Malaysia, the F&N or Fraser and Neave brand makes a clear Ice Cream Soda. Pakistan's popular brand is Pakola Ice Cream Soda (پاكولا, Pākōlā), which is green in color. In Sri Lanka, Elephant House Cream Soda is the most popular soft drink. Meanwhile, Coca-Cola Beverages Sri Lanka launched their newest flavor, "Fanta Cream Soda", in July 2009. In Thailand, Hale's Trading produces Hale's Blue Boy Brand Cream Soda Flavoured Syrup. A green colored rose/floral flavored cordial. This is mixed 1 part to 4 parts water/soda water to get a cream soda drink, very similar to the South African Creme Soda. Or used as a flavoring in their shaved iced deserts. This syrup is sold world-wide in some Asian food stores. Additionally, PepsiCo's division in Thailand produces a green cream flavored soda under their brand name Mirinda. In South Africa and Zimbabwe, cream soda is sold under the label Sparletta Creme Soda, a product of the Coca-Cola company. It is green in color. In South Africa, cream soda is often referred to as the "Green Ambulance" or "Creme Sober" (predominantly by students), as it is believed to alleviate the effects of hangovers. Cream soda is also used as a mixer with cane spirit (an inexpensive alcoholic beverage distilled from fermented sugarcane). This is commonly known as a "John Deer" (cf. John Deere and its green logo), "The Cane Train! ", "Scream Soda" or "Green Mamba". Cane spirit is chosen due its ability to go relatively unnoticed. 1 2 US 332134, Black, James William, "Ice-cream Soda", issued 1885-12-08 "This invention relates to a new confectionery composition or sirup for conveniently and economically making, as desired, a refreshing beverage called "ice-cream soda." The ingredients used in the beverage, except the ice-water, are combined in a concentrated form and bottled for use, so that as occasion demands it may be quickly mixed with ice-water to form an effervescent, refreshing, and healthful drink." ↑ Archived October 23, 2008, at the Wayback Machine. ↑ "Golden Circle Creaming Soda". seniorchem.com. Retrieved 2015-12-29.